5. Instructs its President to forward this declaration, together with the names of the signatories, to the Commission and the Parliaments of the Member States. The declaration closes for signing at the beginning of December, but given the cross party support and the importance of the topic, I am fairly convinced it will get enough signatures and will become European Parliament policy. 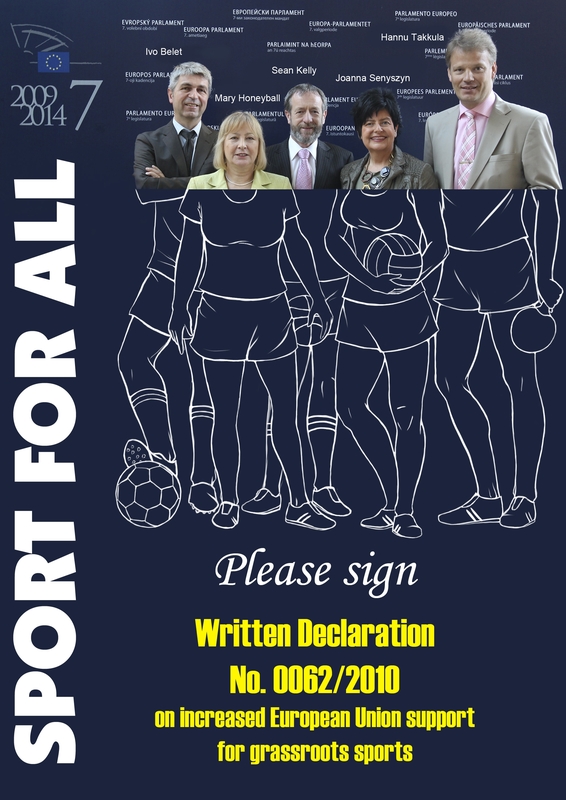 Show your support for grassroots sport and get your local MEPs to sign Written Declaration No. 0062/2010! Together with Anja Weisgerber MEP, Co-Chair with me of the Osteoporosis Interest Group in the European Parliament, I was very pleased yesterday to host a special osteoporosis event in the European Parliament. 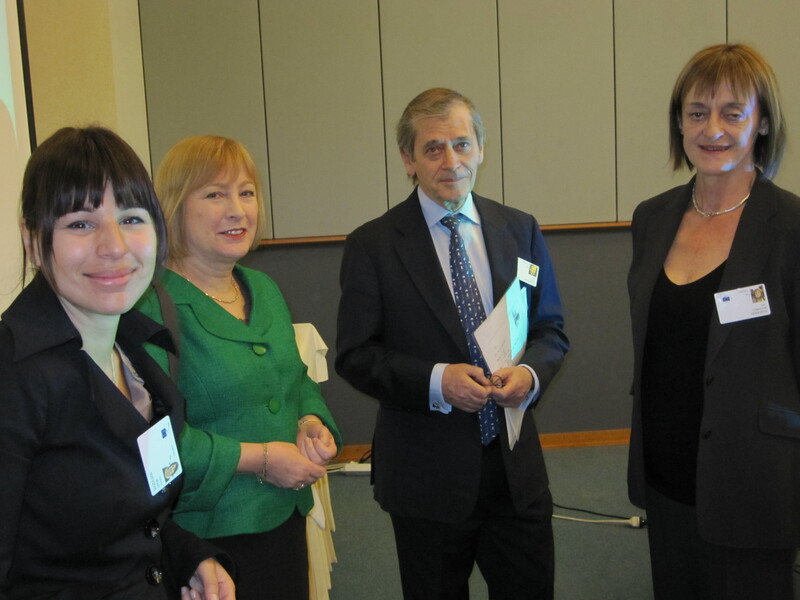 Organised by the International Osteoporosis Foundation (IOF), the event took the form of a lunch, providing an opportunity for the IOF to introduce their work to MEPs and other interested people, and in the process build stronger relations with the European Parliament. The IOF is a small NGO based in Nyon, Switzerland, which aims to educate the public about osteoporosis, empower people to take responsibility for their bone health, persuade governments to make this disease a health care priority, and to assist health care professionals in providing the best possible care to patients and sufferers. 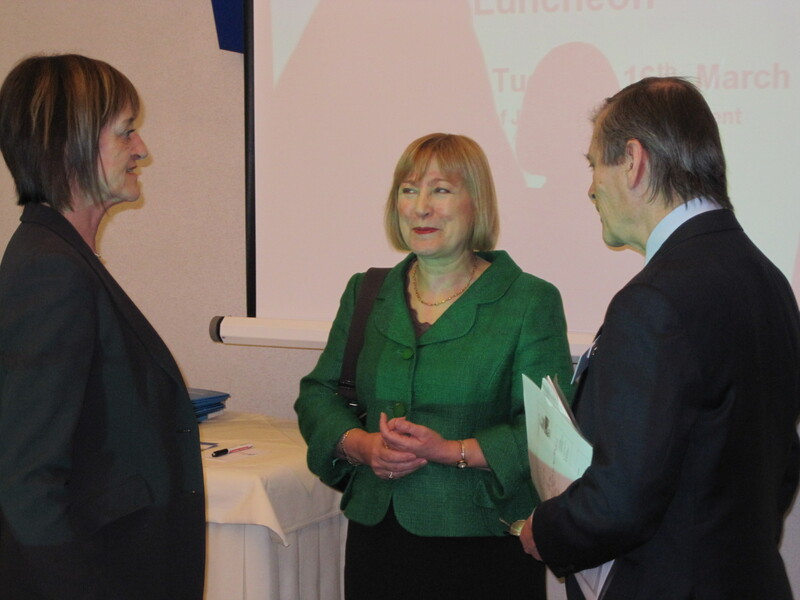 The IOF representatives attending were Professor John Kanis, Professor Juliet Compston, and Victoria Monti. President of the IOF, Professor John Kanis, gave an informative presentation focusing on the urgent need to involve all member states in a coordinated effort to address the gaps in measures to tackle osteoporosis. Osteoporosis is an extremely costly disease, and unless these gaps are acknowledged and addressed these economic costs will only continue to rise as more people are affected. Professor Juliet Compston, who is the Chair of the EU Osteoporosis Consultation Panel, also gave a short presentation, indentifying eight key targets for the improvement of osteoporosis management in EU member states. These include making osteoporosis a healthcare priority, improving the delivery, integration and quality of osteoporosis education and implementing stronger research schemes. She acknowledged the great progress that has been achieved in osteoporosis prevention and treatment policy. However, she also noted that unfortunately many aspects of management of the disease remain unsatisfactory and more is still needs to be done. At present 21 countries do not recognise osteoporosis as a health priority, and full access to bone density scans and treatments are not currently available to high risk individuals in many states. It is vitally important to increase people’s awareness and understanding of osteoporosis and to motivate people to take action to prevent, diagnose and treat the disease. Our lunch was a great success, with MEPs from different groups participating in the debate and in some cases even sharing some of their own experiences. I very much hope they will take what they heard back to their member states’ governments. Later this year, on October 12th, Ms Weisgerber and I will be co-chairing another event in the Parliament, in collaboration with the IOF, to celebrate World Osteoporosis Day. This will be a much bigger full-day event, building on the success of yesterday, with presentations by experts and general discussions. The idea will be to further MEPs’ knowledge of this serious disease and try and put forward plans for action. 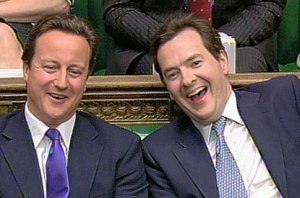 David Cameron and George Osborne’s suitability for government must again be seriously in question after their their latest Sarkozy gaffe. In case you missed the story, Cameron is said to have made a comment about “hidden dwarfs” when discussing a photograph taken with French President Sarkozy, who is 7 inches shorter than the Tory leader. This follows comments in September by Osborne, who, while standing on stage at a conference hosted by Spectator magazine, removed a stool from the stage, joking that it was the “Sarkozy box”. 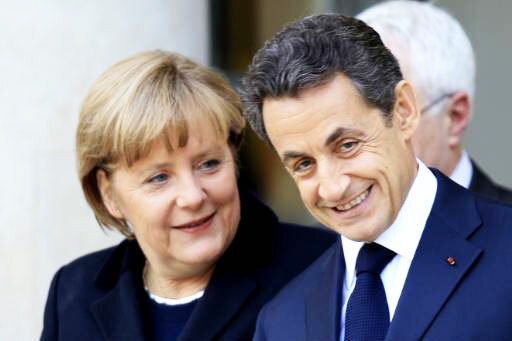 Sarkozy has apparently made a formal complaint to the UK government over Osborne’s childish “joke”. Quite apart from the immaturity and inappropriateness of making fun of people for their size, stature, or appearance – although this is exactly the kind of juvenile humour deemed acceptable among those with the Tory leaderships’ Oxford Bullingdon club background – such mockery of the head of state of a leading nation on the world stage belies a worrying lack of statesmanship. Cameron has already caused the French President regret by pulling his MEPs out of the EPP Group in the European Parliament. Now he and his side-kick move on to personal jibes. Diplomacy under a Cameron government? More like putting both feet into a very large hole and continuing to dig, and most definitely not good for British interests. 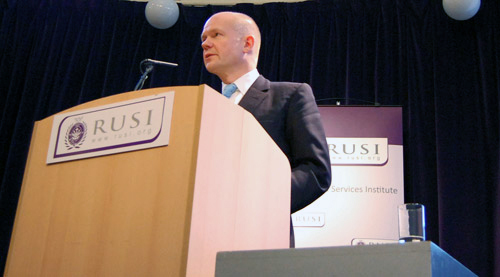 I was, to say the least, surprised to read William Hague’s speech to the Royal United Services Institute this week which outlined the EU’s “enormous importance to the United Kingdom and its foreign policy”. It was also interesting to note that William Hague went out of his way to wish Catherine Ashton well in her role as EU High Representative. Perhaps he should have a word in the ear of some of his MEPs, who have been anything but supportive. Hague’s speech demonstrates that, with a General Election approaching, Tory flip-flops on key policy areas know no bounds. 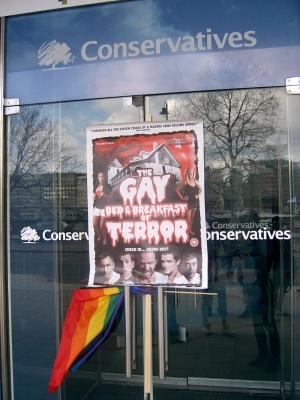 For the past two years Hague himself has been scrambling around Europe making alliances with unsavoury parties from the fringes of far-right politics in order to create the Tories’ new European Conservatives and Reformists Group in the European Parliament. 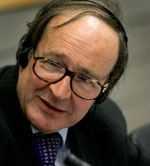 In doing so, he seriously undermined the credibility of the Conservative Party in the eyes of key European leaders such as Nicolas Sarkozy and Angela Merkel, both of whom made known their dismay that the Tory MEPs were being withdrawn from the mainstream centre-right EPP group to which their political parties belonged. This policy, albeit entirely misguided, has won Cameron and Hague a lot of support from the Tory grassroots, with ConservativeHome website reporting that 45 of the new Tory candidates for the forthcoming general election listed repatriation of powers from Europe as their top priority. As regular readers will be aware, we all know how realistic that hope is. Cameron and Hague are walking a tightrope here. On the one hand, they have done very well out of EU-bashing with their grass-roots supporters over the past two years. On the other hand, they have alienated important allies throughout Europe to the detriment of the British national interest. William Hague’s speech dripped with hypocrisy and was surely a belated attempt to undo the damage their anti-EU stance has done. I doubt that leaders throughout Europe will have such short memories. And I can only imagine what the new breed of anti-EU Tory candidate makes of this U-turn. This week sees the launch of the largest group in the European Parliament, the European People’s Party (Christian Democrats) (EPP), previously known as the European People’s Party-European Democrats. It is a group which, like the others, is made up of many successful women who come from numerous walks of life and have enjoyed a variety of different experiences. At least two of the women in the EPP group, including Danuta Maria Hübner of Poland and Sandra Kalniete of Latvia, were Commissioners before entering Parliament. Finnish MEP Sari Essayah has a particularly diverse background. She became a member of the European Parliament in 2009 after working as Party Secretary of the Christian Democrats in Finland from 2007 and as a member of the Finnish Parliament from 2003. Like many of the women profiled in Women in Power, she has spent time working in academia, and is an active member of a several well-known organisations such as Amnesty International and the Finnish Red Cross. However, unusually for an MEP, her career began in the sporting field. 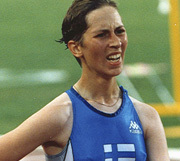 Sari achieved great success as a race walker, winning the European Championships in 1994 and the World Championships in 1993 (pictured). Monica Luisa Macovei, from Romania, also achieved major successes before entering the European Parliament, but in a rather different field. She, like Sari, sat on her national Parliament; in this case as Justice Minister from 2004 to 2007. Her major achievement was to play a lead role in implementing the justice reforms that helped Romania to join the European Union and fight corruption in the country. She is a founding member of Transparency International Romania, and has conducted research on gender in Romanian law and on violence against women. Monica has also been a civil society activist for political reform, democratisation and human rights in post-1989 Romania. 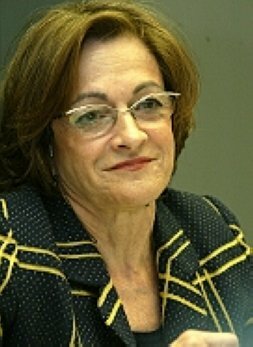 Spanish MEP Christina Gutiérrez-Cortines was too for a time a member of her national Parliament: as Minister of Education and Culture. For much of her career she worked in the cultural arena, and this is of particular relevance to my work as I am currently the Socialist and Democrats (S&D) coordinator on the Culture and Education Committee in the European Parliament. Christina was Director of cultural events at La Verdad newspaper in Murcia from 1989 to 1995, and has also been Director of Cultural Events and Evening Courses at the University of Murcia. She has a doctorate in Art History, and has been a researcher in art and architecture, urban planning and the history of urban development, as well as in the use of new technologies in the field of art history. In the run up to International Women’s Day on the 8th March, I will be launching the remaining women members of the European Parliament on my website. 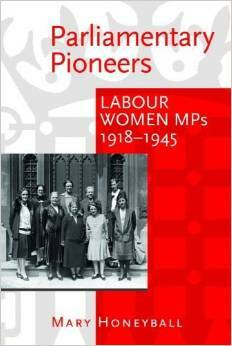 I would very much welcome comments on these or any of the other profiles in the Women in Power collection.